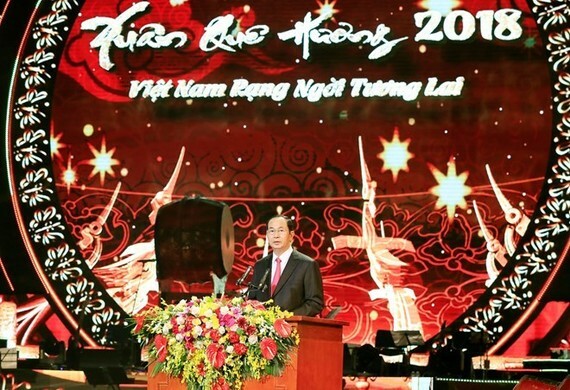 President Tran Dai Quang beat the drum to kick off the Xuan Que Huong (Homeland Spring) 2018 festival in the evening of February 7, welcoming a delegation of overseas Vietnamese (OVs) who returned home to enjoy the Lunar New Year (Tet). The delegation included 90 delegates from 25 countries and territories worldwide, representing 4.5 million overseas Vietnamese living in 109 foreign nations and territories. Addressing the programme, President Quang highlighted Vietnam’s major achievements in various fields and extended warmest Tet greetings to OVs and applauded their contributions to building and developing the country as well as strengthening solidarity among Vietnamese expats and promoting their integration into host nations. “2017 was the first time in many years we completed and exceeded all 13 socio-economic development targets set by the National Assembly,” he said, noting that macroeconomic stability, inflation under control, budget revenues and large balances of the economy were guaranteed. GDP growth reached 6.81 per cent while export-import turnover reached 425 billion USD, the highest figure ever. The President also briefed the OVs about the success of the APEC Vietnam Year 2017 and the 25th APEC Economic Leaders Meeting. “We have successfully completed the role of host, making history in the process of economic integration of the Asia-Pacific region, demonstrating the stature and wisdom of Vietnam and contributing to strengthening cooperation with other countries in the region, major partner countries and traditional friends,” he said. He stressed that the overseas Vietnamese community was consistently considered an integral part of the nation, adding that the Party and Government would continue supporting and creating favourable conditions for OVs to integrate into host countries and make further contributions to national development. Earlier the same day, President Quang and the delegation of OVs offered incense to commemorate late President Ho Chi Minh at House 67 in the presidential historical relic site in Hanoi. The activity took place to celebrate the 88th founding anniversary of the Communist Party of Vietnam (February 3) and the upcoming Tet (Lunar New Year) holiday which falls on February 16. President Quang, his spouse and the delegates then released carp into Uncle Ho’s fish pond to observe the traditional Kitchen God Day ahead of the Lunar New Year. The same day, the State leader and his spouse also offered incense to ancestors who died to defend the country at the Kinh Thien Palace in the imperial citadel of Thang Long. Party General Secretary Nguyen Phu Trong and Prime Minister Nguyen Xuan Phuc also had separate receptions to the delegation of overseas Vietnamese on February 7.